I’ve been using PaintStorm Studio for about a year now and it’s been my daily driver ever since I bought it. PaintStorm was initially developed by a single person, who wanted to create a graphic software that would best suits their needs. Having this in mind they’ve dedicated 2 whole years to developing a program which incidentally (or not) suits not only their own needs but the needs of a lot of other artists. I do believe that PaintStorm has the potential to surpass other commercially used software out there. Some digital artists’ reviews state that the only thing drawing them back (pun not intended, but if the glove fits – wear it) is that the UI is a bit intimidating and they were looking for something that can be used right out of the box. I do agree that the user interface can look a bit scary at first, because when you open PaintStorm Studio, you’re greeted with a bunch of brush sliders, unfamiliar icons, stuff that appears to be all over the place etc. However I’m a firm believer that you have to put in at least a bit of time to learn a given software and not just expect that everything is plug-and-play. Keep in mind that programs are designed by a person (or a group of people) who have a different way of thinking than yours. Of course that doesn’t mean that these people aren’t trying hard to make their software to be as intuitive as possible. Once you learn the logic that drives the program, then you can make it your own and have it work FOR you. I’ve put down a list of shortcuts, some of which are custom and others are built-in. I believe that PaintStorm’s idea behind the default key shortcuts is focused on the left side of the keyboard, so you wouldn’t have to move your hand that much across the board, which would save you a bit of time. 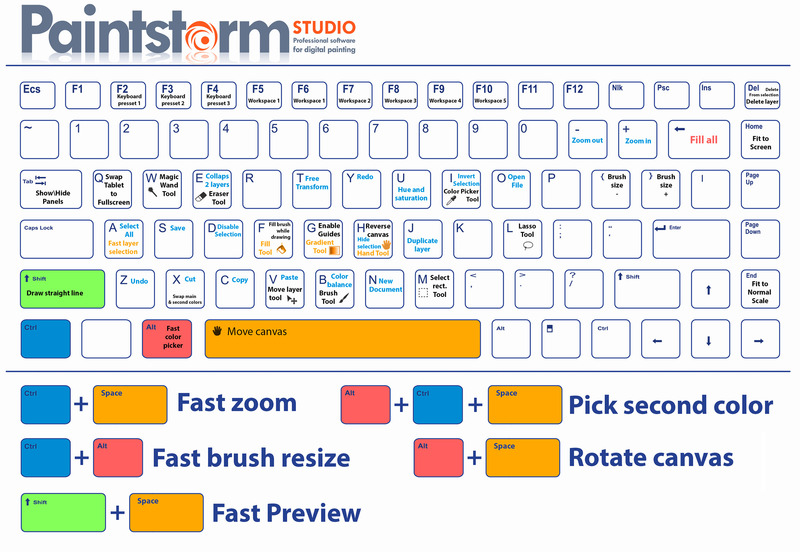 Once you have PaintStorm Studio open, click on the File button on the top of the screen. Click Define HotKeys and there you go! This is it for now, if I add more custom shortcuts, I’ll update the post if I add more shortcuts, which I believe could be useful for someone else too.